• A publication devoted to the black-and-white photographic portraits of Emily Andersen since the 1980s. Includes many high-profile artists, musicians, writers, poets, film directors, actors and architects, such as Peter Blake, Nan Goldin, Derek Jarman, Zaha Hadid, Arthur Miller, Helen Mirren, Nico Michael Nyman and Eduardo Paolozzi. Also documents many inspiring figures who are celebrated and respected within their fields, offering insight into the lives of people who have made significant contributions to the wider cultural and creative life of the USA, Britain and Europe over the current and recent generations. Beyond capturing the essence of her subjects and of their times, Andersen has a particular talent for entering into their private worlds, often being invited into her sitters' own homes. By photographing family members and friends, she gets an angle on them that is often deeply personal, sensitive and honest. Features an essay by contemporary art critic Jonathan P. Watts that not only explores the lives of some of Andersen's many sitters and the photographs she has taken of them, but discusses her practice within the wider critical debates of photography since the late 1980s. Emily Andersen has been making photographic portraits of the international avant-garde since graduating from the Royal College of Art in the early 1980s. Having started out by finding her way into some pretty cool-sounding private parties in London and New York, she began convincing artists and musicians to pose for her - from Nan Goldin to Nico. Over the past thirty-five years, she has built up a remarkable and beautiful portfolio that includes many high-profile writers, poets, film directors, actors and architects, with Peter Blake, Michael Caine, Derek Jarman, Zaha Hadid, Arthur Miller, Helen Mirren, Michael Nyman and Eduardo Paolozzi among those featured in this new publication devoted to her black-and-white portraits. In addition to celebrities, Andersen has documented many interesting and inspiring figures who are celebrated and respected within their fields, offering an invaluable insight into the lives of people who have made significant contributions to the wider cultural and creative life of the USA, Britain and Europe over the current and recent generations. 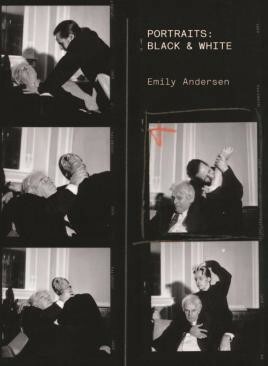 An illuminating essay by critic Jonathan P. Watts not only explores the lives of some of Andersen's many sitters and the photographs she has taken of them, but also get to grips with ideas such as the nature of portraiture, photojournalism and the limitations of the documentary photograph, framing them within debates of the late 1980s onwards. ‘While all of these portraits may not be recognisably activist images', asserts Watts, ‘they're rooted in the belief of a micro-politics of everyday lives and relationships.' Readers can discover more about the background, circumstances and dynamics of many of the shoots by means of notes prepared by Andersen herself to accompany each image, which are regularly entertaining and thought-provoking as well as informative. Beyond capturing the essence of these figures and of the times in which they are living, Andersen has a particular talent for entering into their private lives and private spaces, often being invited into her sitters' own homes. By photographing family members and friends, she gets an angle on them that is often deeply personal, sensitive and honest. Creating works that are carefully composed and choreographed and yet regularly informal and relaxed, there is always, somehow, a sense that Andersen is more interested in encouraging her subjects to speak through her images than in imposing her own impressions upon them. It is also fascinating to note how Andersen is often keen to document the young children of celebrities, especially girls, and has made a substantial body of work of fathers and daughters. She is always interested to know what these young women grew up to be, and sometimes returns to photograph the same people years, if not decades, later. Andersen has been commissioned for innumerable magazines and newspapers including the New Musical Express (NME), The Face, Elle Deco, Domus, The Times, The Guardian, The Independent, The Sunday Telegraph and The Economist, and has been commissioned by publishers such as Quadrille, Simon and Schuster, Oxford University Press, Hachette, Random House and Harper Collins. Her works have been exhibited internationally in venues including The Photographers' Gallery, London; The Institute of Contemporary Art, London; The Scottish National Portrait Gallery, Edinburgh; The Barber Institute of Fine Arts, University of Birmingham; Massachusetts Museum of Contemporary Art; Jehangir Art Gallery, Mumbai; and China Arts Museum, Shanghai. A winner of the John Kobal prize for portraiture, she has a number of works in The National Portrait Gallery, London and in other public collections including The British Library, London, and The Contemporary Art Society, London. Andersen is a senior lecturer in photography at Nottingham Trent University. Designed by Melanie Mues of Mues Design, London, with reprography by DPM, London, and printed by EBS, Verona, this stunning hardback monograph has been released in both a trade edition published by Anomie and as an artist's limited edition of fifty signed and numbered copies, accompanied by an original print.